Last night I had the priveledge of attending the North Vancouver Community Arts Council's opening of the Art Rental Programme and 10th year anniversary. This was a special celebration because they were officially opening the expanded Art Rental portion of the gallery. Not only have they been able to take over more space from next door when the other tennants moved out, but they have procured some lovely movable wire racks in which to carefully store the paintings year round. They have set up a desk with a computer terminal so prospective art collectors can view the artists and images available and then the actual work can be pulled out from its storage space on the racks. The catalogue is also available online so at any time, collectors or artists can view the available works and see if a piece is in or out or has been sold. The new area is absolutely beautiful and fully functioning. I am very excited and proud to have seven art pieces in the program. As usual for the gallery, the event was well attended and the works were wonderful. There are so many talented artists in the area. It is an inspiration. I was also very elated to note the people commenting on and enjoying my works. I found out that one of my pieces from last year (usually the pieces stay in the program for two years) had sold-- The Capsicum Monk. I was very pleased to hear that. We were treated to the wonderful musical stylings of the North Shore Celtic Ensemble. They really got the house tapping and clapping, and were a fantastic addition to this exciting evening. Mayor Darrel Mussatto and Executive Director Linda Feil both gave rousing talks about the importance of having a community art space and how it benefits everyone in the community. The evening was complimented by enjoying a piece of 10th Anniversary Cake to celebrate the gallery's decade in existance. The show will be up until January 29th, so please take the time to pop in. It's located at 335 Lonsdale Avenue, North Vancouver BC. I am happy to participate in the Twitter/Art + Social Media Show taking place at the Diane Farris Gallery in Vancouver. As an early adopter of the Internet, Diane Farris Gallery has been interested in its possibilities since the creation of the gallery website in 1996, when less than 1% of the world population was online. Through Twitter/Art+Social Media, the gallery examines how social media is affecting the practice of artists who use it to share feedback and promote their artwork, organize shows and produce art collaboratively. 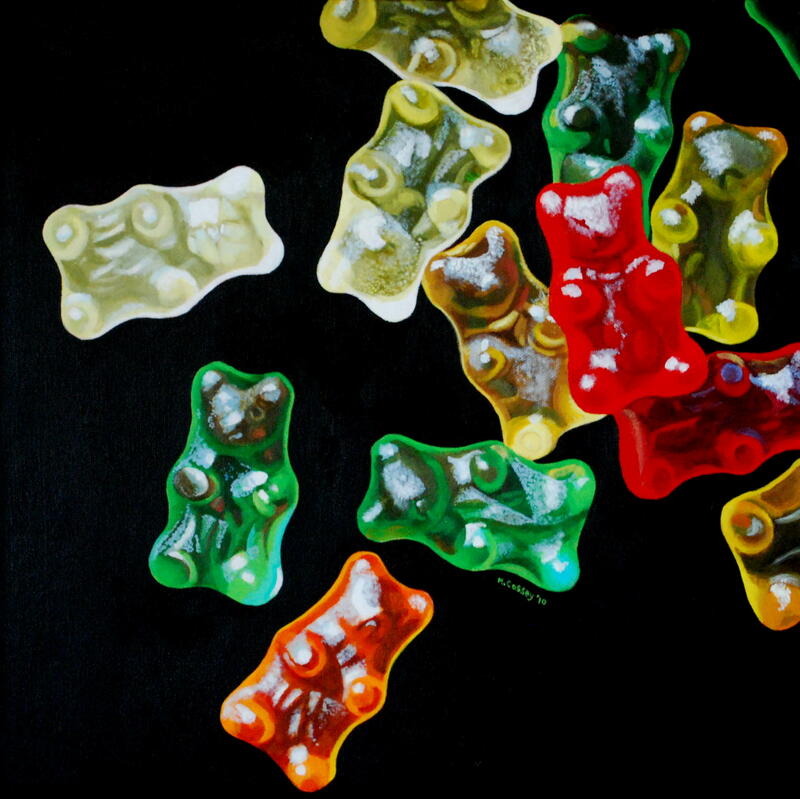 With 80 – 100 artworks by over 40 artists from across Canada and abroad, Twitter/Art+Social Media showcases a broad spectrum of influences of social media. While some artists draw their subject matter or medium from social media, others are working in more traditional forms and using social media to promote and display their work. The result is an exhibition that brings together works as diverse as painting, photography, video and sound to show how the artist’s practices are shifting. The exhibition will be accompanied by a forum on art and social media on Diane Farris Gallery’s newly launched blog, www.dianefarrisgallery.com/blog. The blog will also feature various web-based artworks through out the duration of the exhibition. The gallery will use the blog, Facebook and Twitter to announce performances and events in and around the gallery. The artworks in the show were selected by a multidisciplinary committee from submissions to the gallery’s open call during February. The selection committee was composed of Lili Vieira de Carvalho, curator of the show and Associate Director at Diane Farris Gallery; Kris Krug, photographer and web strategist; Dr. Maria Lantin, Director of the Intersections Digital Studios (IDS) research centre at the Emily Carr University of Art + Design; and Hank Bull, the Executive Director at Centre A. The gallery hopes this exhibition will become a catalyst for other groups and institutions to further explore the topic. Tonight's location was Colony Farm. Colony Farm is so named because the inmates from Riverview Hospital Sanatorium (also called Essondale) used to farm the grounds there. Now it is a thriving community garden, of which my husband and I have two plots there. This evening we brought our dinner to the garden and after finding a nice picnic table in the shade of a grape vine, I discovered this subject of tonight's painting. 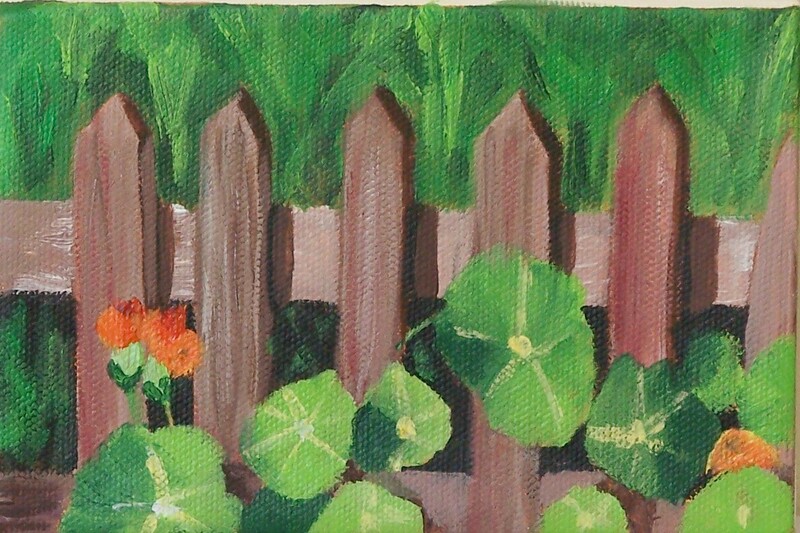 This is a mini scene on 4X6 canvas of some nastursums vying for the light around a very low (2 ft. high) fence. 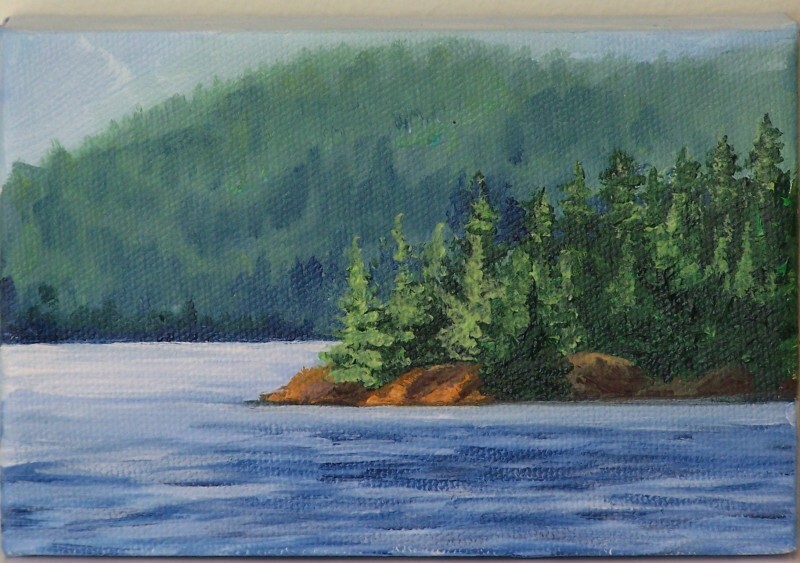 Tonight's painting is done from Barnet Marine Park off the Barnet Hywy between Burnaby and Port Moody. The view is from looking over the inlet across to Belcarra Park. I was joined by two other artists. We had very nice painting conditions, setting up in the shade to look out at the sun slicing down the inlet to highlight the dried grass of the rock. We had many onlookers stop and observe our different paintings and sketches and it was nice to have the company. While we were painting, an eagle swoooped down in front of us and plucked a fish out of the ocean. I wish I had a camera in my hand instead of a brush. That is one advantage of a camera over painting, lol. These Hollyhocks are from my garden, grown from seeds given to us by a 40 year family friend. This year they grew extremely high- 9.6ft to be exact. My first outting in Plein air and I learned a lot. First, don't start a such a large canvas. This was 16X20 and it took me three days to finish it. On the third day very strong gusts of winds came up and began to blow the hollyhocks hither and yon. Being so tall, they were bending over at 45 degree angles. Some of them started to break at the base, luckily it wasn't the ones I was painting. Still I got my son to come over and hold them in position while I took a photo and did the last 20 minutes of work back in my studio. 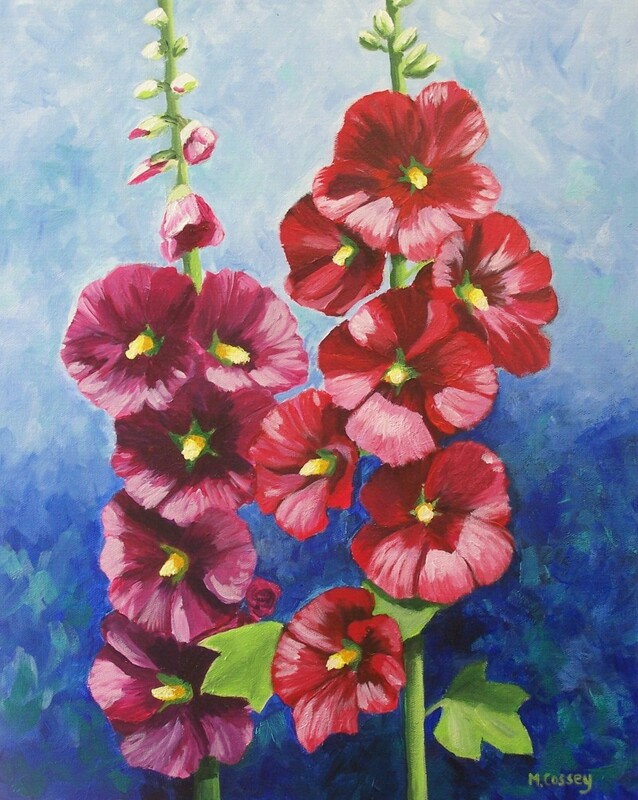 I named the painting "The Pointer Sisters" because back in Victorian times these flowers were planted around the outhouse pointing the way to the privy. Because of their height they could be seen from anywhere in the garden thus relieving modest Victorian women of the embarassment of having to ask the hostess where the 'little girl's room" was. En Plein Air is a french expression, meaning "open air" or "in the fresh air." Before there were photographs, if artists wished to capture a scene, they would have to expose themselves to the elements in order to capture that scene on canvas. That meant tolerating all the realities of nature, such as sudden wind gusts, cloud bursts, sunburns, bug bites, distracting noises and talkative onlookers. Similarly, I recently found myself longing to experience what those artists of long ago experienced, namely braving the trials and tribulations of nature in order to learn some very valuable artist skills. I venture to teach myself a better understanding of perspective, depth of field, quickness and looseness of stokes and a better understanding of light temperatures, colours and hues. This is what brings me to Plein Air painting. I invite you to visit my blog daily, where I will be posting the day's painting along with the story of how it came to be. On the main page of my website I will post the day's location as well as a link where you can read more information about the area where I'll be painting. If you live locally, please come down and visit me. Bring your painting supplies and join me. If not, please visit the link and you can be with me in spirit. I love this time of year, particularly because I have always asked for, anticipated and manifested receiving books as gifts. Thus year end/new year beginning is a time I look forward to for learning and personal reflection. Recently as an artist I find myself being drawn further towards the realm of wildlife painting. One particular artist has caught my attention, a Belgian artist by the name of Carl Brenders. Being 1 quarter Belgian myself I feel a particular bond to this fabulous artist. This Xmas fortuitously, I received both a book and a magazine containing interviews with the great Mr. Brenders, so I was blessed to be able to have a little more insight into the life of this great artist. I was particular struck by his comments about how emotionally attached he is to his own work, not in any kind of haughty or self important way but because of the sheer emotion, care, deep respect and attachment that is poured into each and every work. He made the comment that when he sells a painting it "hurts my heart." I so resonated with this statement that I had to put the magazine down and just close my eyes and have his words move through me. This brought up a lot of emotion for me. Emotion I'm not always aware of its source but this simple statement was a revelation for me. Recently I sold two paintings and a print and I must admit that I have been experiencing a sort of back log of emotion. A lot goes on when an artist, well when *this* artist sells a painting. There are emotions that need a sereneness to be honoured and moved through and ultimately find their voice of rejoicing. When one of my paintings finds a new home there is a moment when my soul sings. It says "yes, someone has understood the song of my soul. Someone has understood it so well that they are willing to exchange their energy for mine in order to obtain its gifts." That is so huge!! With that comes what I feel to be a huge responsibility on the part of my soul. It is the responsibility for that little artistic expression to keep up its end of the bargain, to go on without me to spread its voice to the new environment. There resides at this moment the giving over of its energy from a piece of my spirit, of my essence, and setting it free to live a life of its own and of the new owners will. What goes out from me is pure consciousness, to be handed over to the care of someone else. In this process goes a piece of my heart. It is a good thing but there is a sense of loss, albeit a blessed and happy loss, a loss just the same. Recently while in the company of some perhaps a lot less experienced and sensitive to the gentle art of energy exchange, I was questioned, judged and even ridiculed for my personal feelings and the process I go through in selling a painting, as though my gifts, insight and sacred processes were stupid illogical and just plain nonsense. "Why are you an artist if you don't want to sell paintings?" Wait now, who said I didn't want to sell paintings? There is beauty in these emotions I go through that revolve around "sales" There is quiet gratitude. There is the blessed gift of being understood and honoured for showing someone your views and having them appreciated. I am touched when I have touched others. This the spring of the tears that well within me, begging for release when someone buys my painting, indeed a piece of my soul. This is what I live for, to touch the human heart by my words or by my brush, and each time I sell a painting, a poem or a piece of information, there are tears of gratitude that I have reached someone with the vibration of my own personal frequency.